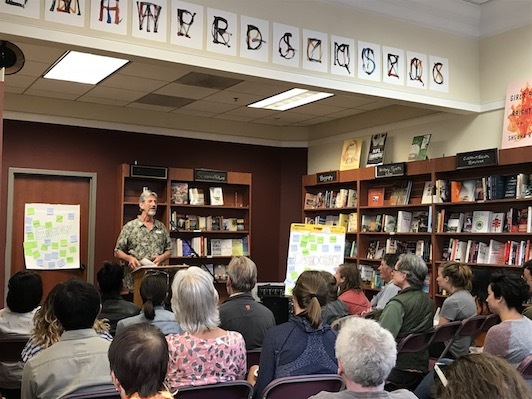 On Thursday, July 26, 2018, the Local Clean Energy Alliance (LCEA) hosted a book event featuring LCEA coordinator, Al Weinrub and other author’s, Energy Democracy: Advancing Equity in Clean Energy Solutions at Laurel Bookstore in Oakland, CA. Weinrub spoke of the ongoing energy democracy movement taking place across the country. The movement involves the consumers of electricity having an increased role in the choice of their electricity source through city or county ownership of electricity providers, such as community choice energy providers. Energy distributed in a democratic way brings the benefits of clean energy, such as decreased emissions and local green jobs, into local communities that have been most impacted from fossil fuel energy providers. The LCEA has been a strong impetus to initiating East Bay Community Energy, Alameda county’s community choice energy provider. Weinrub also mentioned the various chapters in the book, which all feature a different story of grassroots organizing to reach clean energy solutions. For example, he highlighted the work being done in Mississippi by One Voice to engage the community and take back control of the rural electric cooperatives. Over thirty-five people attended the event, which also featured the announcement of the Energy Democracy National Tour and a LCEA book club. We hope to create an accessible and literary community that forms dialogue and engagement in the energy democracy movement. The book club is a vehicle of empowerment for individuals to advocate for clean energy solution. Please join us for our next gathering on Tuesday August 28, 2018 at EcoBuilder Building to discuss the first month’s book choice, Energy Democracy. The club will discuss other book options at the August 28th meeting.